1. Bake 100g of cashnuts in oven at 180C for 10 minutes. Chopped up cashnuts into small pieces. Set aside the remaining 200g of cashew nuts. 2. Cream butter and icing sugar lightly at speed 1 using K beater. Add in egg yolk and vanilla essence. Mix well. 3. Stir in Ingredients B and chopped cashew nuts. Mix well. Chill dough in fridge for 40 minutes. 4. Remove dough and roll into small balls. Arrange on a lined baking tray. 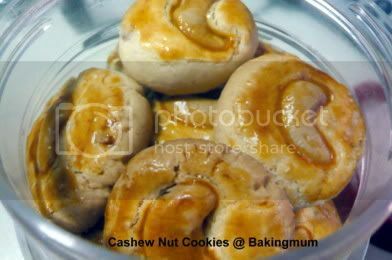 Brush with beaten egg yolk and place a whole (or half) cashew nuts on top of cookies and press slightly to flatten it. 5. Bake in a preheated oven at 180C for 15 minutes or until it is nicely brown. Cool and keep in airtight container. wow, came across ur blog, love all ur bakes.. i'm thinking of buying an oven. can i see a pic of urs? thanks for the recipe. Just to clarify: you place raw cashewnuts on top of the cookie? omg! Thanks heaps for the recipe!! Yes Chrsitine, I used raw cashew nuts on top. Did half of the recipe. It was soft crunchy & not so sweet. Tks for sharing. Definitely a keeper! My cookies tasted a little bland. Can I add 1/4 tsp to the dough? I only added 100g of ground cashew nut to the dough. Can I add more so the taste is more intense? Hi Christine, you can add 1/4 tsp of salt. For me, what I have done is to use that 100g of roasted cashew nuts and chop it up roughly, not too fine. Then I also added about 2 to 3 tbsp of finely ground cahsew nuts into the mixture. Mrs Yeo, glad you like it. Wishing you and your family a Happy and Prosperous Year of Niu. Love your blog. The almond cookies look great. Are you able to share the recipe? i already tried your receipe and turned out delicious, crispy and nutty. Will try again during CNY. thanks.